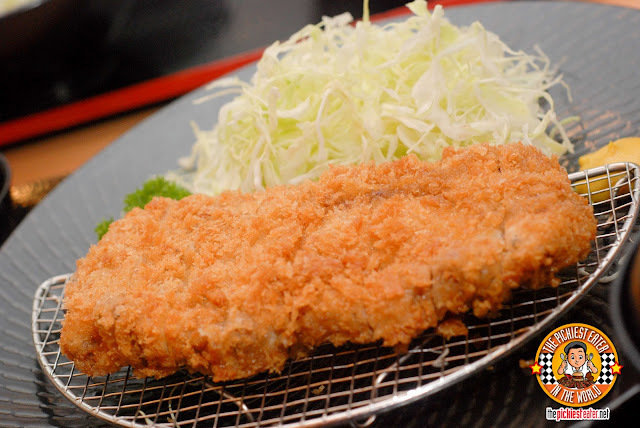 THE PICKIEST EATER IN THE WORLD: THE PICKIEST EATER'S ANNIVERSARY GIVEAWAY #4: YABU: THE HOUSE OF KATSU!!! 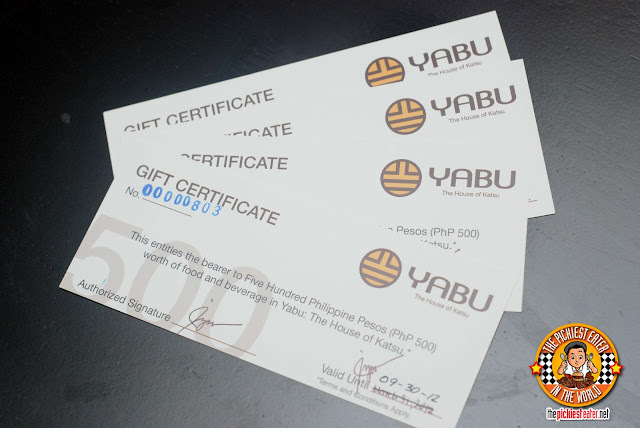 THE PICKIEST EATER'S ANNIVERSARY GIVEAWAY #4: YABU: THE HOUSE OF KATSU!!! Ok so I finally caved. I seriously debated with myself whether I should give these Gift Certificates away or not, simply because Rina wasn't able to attend Yabu's "Katsu for 25" Event, and she made me promise her I'd take her to try the new Seafood Katsu 2. But in the end, the clamor of the public was just too strong to ignore. And because you asked for it.. you got it! P2,000 worth of Gift Certificates from Yabu: The House Of Katsu!!! But what you definitely don't want to miss, are their two new dishes. One of them was the dish that Rina wanted to try.. Yabu's Seafood Katsu Set 2. 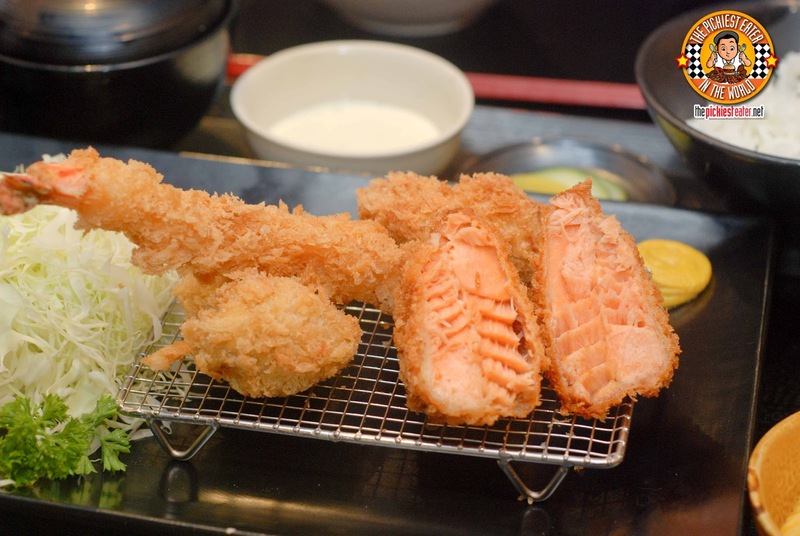 Its a combination of Salmon Katsu, a large juicy Tiger Prawn, a Hiroshima Jumbo Oyster, and the newest kid on Yabu's block.. The Creamy Crab. 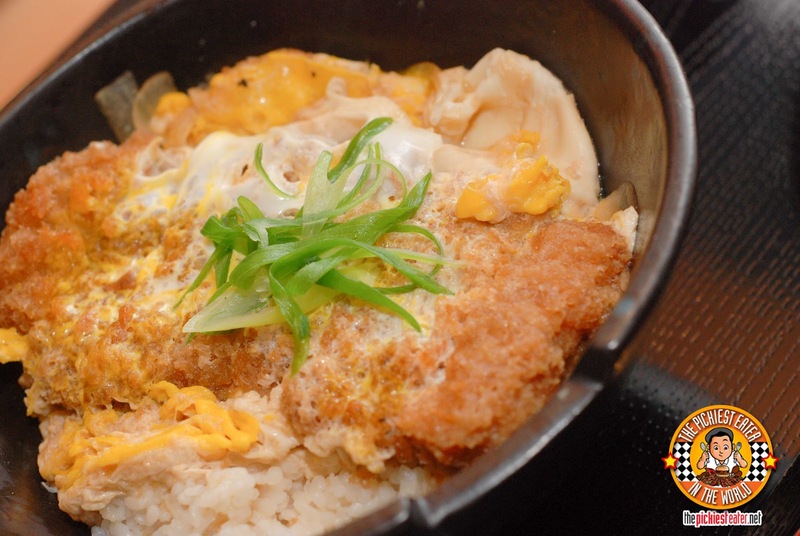 Their newly launched Special Katsudon is something I'm going back for the next time I visit Yabu. It was a beautiful medley of flavors brought on by different components that fused together seamelessly into one amazing bowl of awesomeness. Ok, I know what you're thinking..
"Shut up already and tell me how to join!!!" It's quite easy, actually! But I've added a Rafflecopter Widget at the bottom of the page to make things even easier! (if you haven't yet. If you have, go straight to #2 you overachiever, you). 2) Like the YABU: HOUSE OF KATSU page on Facebook. - Just click on the Facebook "Share button" located below the title of this post. the "Share This Link" window will open with a "Write Something" box in it. If not, the login window will appear first. Make sure that the posting option is set to "Public". Just click on the little globe icon on the right side of the share window. - In the box, type "I want to try the new dishes of @Yabu: House of Katsu, so i'm joining @The Pickiest Eater In The World GIVEAWAY #4!" Then tag two friends. In order to tag your friends as well as both Yabu: House of Katsu and the Pickiest Eater Facebook Page, please don't forget to type the "@" sign before their names so their profile names become clickable for a tag via the drop down selection.
" I want to try the new dishes of Yabu: House of Katsu so i'm joining The Pickiest Eater In The World ANNIVERSARY GIVEAWAY #4 Kevin Bacon Francis Bacon"
Of course, replace "Kevin Bacon and Francis Bacon with then name of your friend, and you're good to go (Unless of course, you are actually friends with them, then feel free to tag them too)! 3) Add me, @TheRealRichieZ on Twitter! 4) Add @yabuPH on Twitter! 5) Share the Tweet: " I want to try the new dishes of Yabu: House of Katsu & The Pickiest Eater In The World ANNIVERSARY GIVEAWAY #4 #ThePickiestEaterGiveaway "
But we will only ship the GC's to an address at Metro Manila. Please take note that as of this writing, Yabu: The House of Katsu has only one branch, located in SM Megamall. 7) One entry per person only! However, the tagged friends are welcome to enter the contest. 8) The contest starts today, July 2,2012 and ends on July 21, 2012. The winner will be notified through email and will be announced on July 22 here in my blog, The Pickiest Eater Facebook page and Twitter account. 9) Winners will be chosen through a Rafflecopter. The Winner will receive the GC's via Mail or Metro Manila meet up. The GC's were given to me by Yabu: House Of Katsu for my own perusal. I am not affiliated with Yabu: House of Katsu in anyway, with an exception of my face being used as their wall ornament leading to the restroom. Please follow the instructions! If you miss out on one, your entry may not be counted by RaffleCopter! In case you're confused with the mechanics, Just Follow the Rafflecopter Instructions, or Email me at pickiesteater@gmail.com. Thank you for the GC's! Everyone went Bananas when I announced the giveaway! haha pag big time na ako, Yasir! Promise! haha best of luck you guys! Congrats to you guys too!! Would one have to have both Facebook and Twitter accounts? What if one only has Facebook? joining! i love yabu just been there last father's day yayy!! Did you try their new menu? 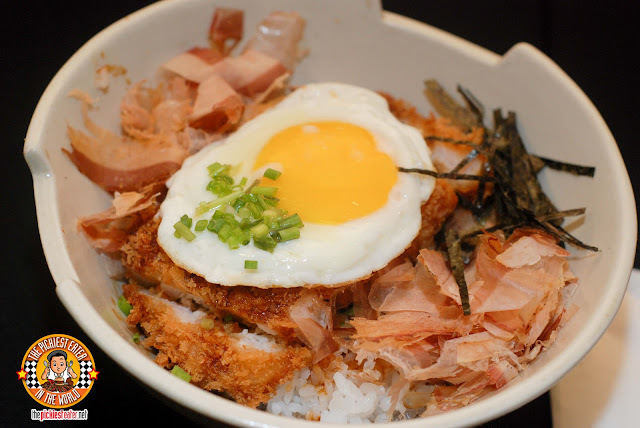 I loved the special katsudon! Same question as Katrina. I don't do Twitter as well. Does that mean we're disqualified because we have an FB entry only? What????? You need a facebook account to join the raffle? Thats so lame. Haha yeah sorry Nico! I was contemplating naming it "The Pickiest Eater's Lame Raffle" but I was worried no one would join! Promise yun patty ha?? hehehe Good Luck! Thanks Kitten! I'll be crossing my fingers for you too! Thank you Jen! Good Luck! haha love the energy Joan! Good luck! first time to join your anniversary giveaways! haha Czaroma! this was the first time my face was pasted on a wall that wasn't on a "wanted" posted! I like to try the Rosu Katsudon which you personally recommend.Hope to win.A perfect gift for my Husband.. He's gonna love it for sure, Marlene! Thanks for the support francis! I'll have my fingers crossed for you too Nerissa! yahooo!!! I'm finally done:) Hope I Win! Best of luck to you yvette! I hope to win. I am so hungry!!! !